November 28, 2011 – SECOND POST TODAY. MERCURY NEWS SERVICE HOT INSIGHT OF THE DAY: TURKISH F.M. 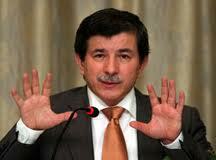 AHMET DAVUTOGLU VOTED “CUDDLIEST IDIOT OF THE YEAR” BY MATTEL TOYS EMPLOYEES. Elsinore Vabhend special to MNS reporting from Antalya, Turkey. Charles Aznavour, Idi Amin and Nazi Reichsmarschal Hermann Goring. Boo! exclaims the renowned foreign minister to a bevy of Turkish beauty pageant contestants in Istanbul causing much hurly-burly at the local seraglio. Besides being short with the disarmingly boyish grin of an Appalachian pig farmer, `Oglu’ as he is called by his friends, is a feisty, hyperactive, puckish, rakish flake of an imp with the temperament of a banshee. Having written his Ph.D. thesis in some unpronounceable Anatolian university with the title of: Alternative Paradigms: The Impact of Islamic and Western Weltanschauungs on Political Theory, he flaunts his Turkic erudition, cane and all, like a dilettantish boulevardier in Montmarte. He struts and strolls, dips and curtsies, twirls and swirls like a whirling dervish. And all this while doing absolutely nothing. Well, Congratulations Mr. Davutoglu on your award. We understand that you will receive a lifetime subscription to Cracked Magazine and a plastic replica of a 1969 Rambler automobile for your fireplace.